5 Reasons To Choose a Mobile App Instead of an HTML5 Site. Why develop a mobile application when your website is responsive? It is possible to send "push notifications" to users who download the application even if it is currently closed on the phone. So, this opens the possibility of scheduled reminders and other such events in the mobile application. Note that some browsers allow more and more access to these kinds of features with PWA (Progressive Web Apps), but it is not yet universal. 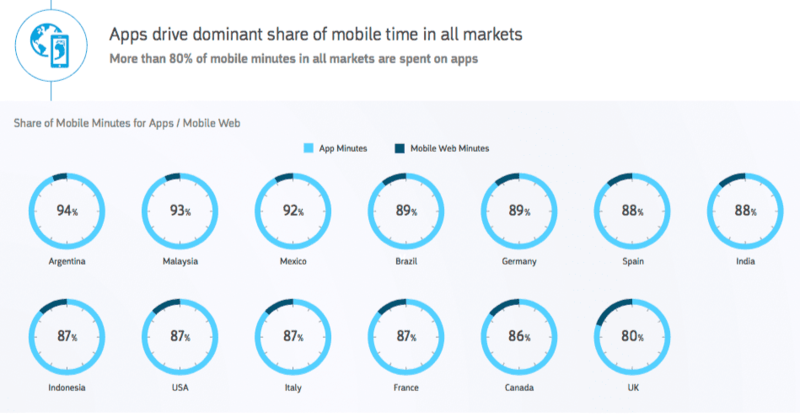 Probably one of the most important points of this list: a mobile application can easily work offline by self-managing with content that updates as soon as a connection to a network is available. In addition, this allows increased performance because no server call means no waiting for the server to respond. The content update can happen while browsing through the application which provides the user with a very fluid experience. Since the code is native, it is calculated directly by the phone and does not go through a browser to be executed. The result is clear, crisp, and accurate: increased speed for increased user experience. There are no visual constraints such as the physical limitations of a navigation bar in the screen, unavoidable on a responsive website displayed on mobile. We have more room for the application screen as well as for its customization. This provides, again, a more immersive user experience. - When it comes to mobile phones, people spend 86% of their time on applications, the other 14% only on the internet browser. The OTHER side of the coin (because there is always one). It should be noted that computer-based web browsing is still more prevalent than on mobile. Thus, responsive web sites reach way more people than a mobile application. In addition, "PWA" (Progressive Web Apps) are gaining in popularity every day and becoming more and more universal (i.e. browser compatibility). It can be more expensive and less efficient to develop a mobile application without having a responsive website. However, be aware of your target audience. If you are mainly addressing mobile users and / or already have an adaptive website, a mobile app will help you increase your impact on your audience. This is all part of Digital Marketing. Do not hesitate to ask our web agency for more on this.